NAFA’s trading activities date back to the foundation of the Hudson’s Bay Company (HBC) in 1670. From the earliest days, the marketing of furs was done in a competitive environment, originally by a sealed bid and subsequently at public auctions held in London, England. The history of the fur trade is inseparable from the history of Canada and the United States. Explorers quickly recognized the economic advantages of the export of fur pelts to Europe and began the trade that would define the location of major cities in both countries, first as fur trading posts and much later as modern metropolises. The Hudson’s Bay Company, the oldest incorporated company in North America, received its Charter in 1670 from King Charles II, although trading had actually begun decades earlier with the expeditions of Jacques Cartier and Henry Hudson. In an effort to fill in the blank sections on their maps, the Hudson’s Bay Company was constantly exploring and establishing local fur trading posts. They quickly became one of the biggest landowners in the world. The newly formed government of Canada was lucky to be able to buy back a big piece of the pie for 300,000 pounds in 1868. A great buy when you consider the state of Alaska was bought from the Russians for almost $7 million dollars only ten years later. After 1925, the Hudson’s Bay Company began to segment its operations into departments: Fur Trade, Land, Wholesale Distribution, Retail Stores, Natural Resources and others. In the 1930's the Fur Trade department emphasized the rebuilding of trading posts in the North and expansion of transportation facilities – all in an effort to ease the movement of furs from the wilderness to the auction room. As a result of an expanded consumer market in North America, in 1949 the Hudson’s Bay Company opened its first Canadian fur auction operation in Montreal. This operation served as a sales outlet for the Canadian fur ranching community and independent consignors of wild fur, as well as for fur collections purchased by HBC through its Northern Stores and raw fur divisions. By 1970, the Hudson’s Bay Company continued to maintain auction houses in its traditional locations of London (England), Montreal and New York to service the traditional fur trade centers. Changes in corporate direction in the late 1980's resulted in a number of decisions which saw HBC selling off many of its assets including: the distillery, mining, real estate and eventually the fur division. As a result, in February 1987, the Hudson’s Bay Company sold the Canadian fur auction business to the Canadian Fur Division management group and its supporting fur producer groups, Canada Mink Breeders Association (CMBA) and Canada Fox Breeders Association (CFBA). The new company was named Hudson’s Bay Fur Sales Canada Inc. and continued the 300-year tradition of Hudson’s Bay in the fur trade. In June 1989, the company also purchased Hudson’s Bay Company’s New York auction business, and operated it out of the New York area under the name Hudson’s Bay Fur Sales New York Inc.
On May 2, 2000, exactly 330 years after the issuing of the charter of Incorporation for the original Hudson’s Bay Company, the NAFA Wild Fur Shippers Council (WFSC), representing the ownership interest of Canadian and American trappers, completed the circle with the purchase of shares in NAFA. 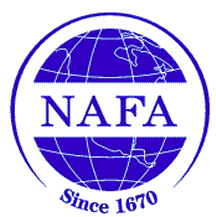 NAFA is 100% owned by these four producer groups.